There are many, many pie-in-the-sky gadgets on display at the Consumer Electronics Show: 150-inch flat-panel TVs, five-figure speaker systems, totally tricked out car stereos—if you can imagine it, chances are someone is showing off a prototype somewhere along the Vegas Strip this past week. But what about more pedestrian fare—the stuff you can actually buy and, more important, might actually use? After trudging the endless aisles of CES and coming away with far more information than I could possibly manage, it’s worth taking a look at a few products that stood out for being Things I Might Buy Myself. I’ve used multiple displays for so long that I have trouble working on a single screen. Which means my desk is cluttered with LCD screens and their stands. Ergotron showed me a new display stand that could help improve both my use of desk space and my ergonomic setup. The $129 Neo-Flex Dual LCD Lift Stand is a single stand that holds two 21-inch (or smaller) VESA-mount LCD displays. Even better, you can adjust the height of the displays, swivel the stand from side to side, or pivot each display into portrait mode with minimal effort. 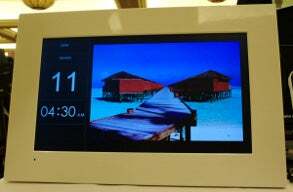 One downside is that you can’t adjust the height of the displays relative to each other; however, the company said that relative height adjustment is a feature they may provide in the future. Ergotron also demonstrated the new Neo-Flex Combo Lift Stand, which replaces one of the Dual LCD stand’s mounts with a laptop stand, so you can use your laptop screen and external display side by side. As someone who covers the iPod as part of my job, I have a few iPods. Well, more than a few. OK, many. Far be it from me to complain about such a situation, but there’s at least one drawback to having so many iPods: charging them. Without setting up several USB hubs or a number of power strips, and then connecting innumerable dock-connector cables, I can charge only a couple at any one time. The result is that I often pick up an iPod to test it with the latest accessory, only to find that the player’s battery has been dead so long that it can’t even muster up the energy to show me the Low Battery screen. So I was outwardly excited—I think I actually frightened my colleague Dan Moren—when Griffin Technology showed me the company’s upcoming PowerDock 4. As its name implies, the PowerDock 4 is a dock that charges four iPods simultaneously. That’s right: four. You’ll still need to connect each iPod to your computer to sync it with iTunes, but now you won’t have to choose which iPod you want to charge overnight. Among the slew of new computing and iPod accessories from Belkin was a clever new surge protector, the $50 Conserve. If you’ve been paying attention to the news over the past few months, you’ve surely heard about “phantom” power, a term used to describe all the energy wasted thanks to gadgets that draw power even when they’re not turned on. Many environmental groups advocate unplugging everything, or connecting devices to power strips and then turning the power strips off, when not in use. But there are two problems with that approach: first, it’s a hassle; second, some products, by design, really do need to draw minimal amounts of power 24/7. The Conserve, a power strip with surge protection, aims to address both issues. Of its eight outlets, six can be switched off while the other two always provide power, making it convenient to connect all your devices to one strip. But the most unique feature is that, instead of making you reach behind or under your desk to switch off the power strip, the Conserve includes a radio-frequency (RF) remote that lets you turn off the switchable outlets with a click of a button; you can even set up a single remote to control multiple Conserves. A simpler, but still unique, product from Belkin is the upcoming $50 Laptop Hideaway. I don’t know about your family, but in our house it seems like someone is always using a laptop in the family room, which means that said computer ends up sitting on the coffee table or leaning up against a piece of furniture. The Hideaway looks and functions much like a magazine rack you’d place next to your couch, but its “magazine” pocket can also accommodate—and protect—a laptop; compartments in the other side can hold a power adapter, cables, or other accessories. The Hideaway’s handle is also sturdy enough to carry it, cargo and all, from room to room. The available color combinations, chocolate/tourmaline and khaki/tarragon, are attractive, although I hope the Hideaway will eventually be available in solid colors, as well. Everyone loves big TVs…except Mother Earth. TVs use lots and lots of electricity, and the bigger the panel, the more juice needed to get that bright, crystal-clear image across your room. So I was heartened to see Philips’ horribly-named 42PFL5603D energy-saving TV. (Thankfully, it has a much better nickname: Eco TV.) Although not inexpensive for a 42-inch, 1080p LCD at $1,399, it’s not priced outrageously, and over time, it just may pay for any price premium thanks to a number of energy-saving features. For example, a room-lighting sensor lets the TV automatically dim—and, thus, use less energy—in darker rooms (which has the added advantage of making viewing more comfortable at night). The TV also reduces the brightness of its backlight, instead of just obscuring the light, during darker scenes. Finally, a power-saving mode lets you set the peak brightness. Philips hasn’t yet updated the company’s Web site with information about the 42PFL5603D, but CNET has more details, including these informative tidbits: the 42PFL5603D is lead-free and nearly mercury-free, and the TV is even shipped in box made of recycled material. When it comes to the concept of digital-photo frames, I’ve been on the fence. On the one hand, they waste energy and can be distracting. On the other hand, it would be nice to be able to glance up and see a slideshow of my family throughout the day. But Mustek, purveyors of many a digital frame, was showing off two products that might get me off the fence and into the nearest store. 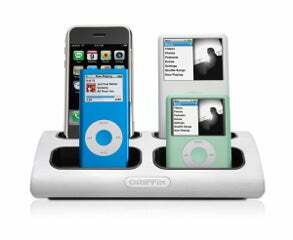 The first is the recently-announced PF-i700, a seven-inch LCD display with an iPod dock cradle in back that lets you view images hosted on your iPod. If you’re already syncing photos onto your iPod, this approach means you never have to deal with manually transferring photos to the frame itself. The other frame I really liked is an upcoming model, shown above, featuring a beautiful widescreen display (approximately 15 inches, as I recall) and an attractive, gloss-white frame. Your photos can be made to fill the entire screen, but what makes this model unique is that you can instead show your photos in traditional 4:3 format and use the remaining space on the left side of the screen to display a clock and calendar.